Much has been written about the shocking events that toppled the Romanovs so it’s a brave author who places his fictional narrator at the heart of the Tsar’s household in the last years before the Russian revolution. John Boyne seems to specialise in writing fiction that is set in a very specific place and time, and I really enjoyed his novel “The Boy in the Striped Pyjamas” in spite of the problems with authenticity which will gnaw away at any readers not willing to suspend their disbelief; it is the sheer simplicity of that work that makes it such a success but the same cannot be said of “The House of Special Purpose”. The narrator is Georgy Jachmenev, who, when the story begins is a fifteen years old peasant. Georgy saves the life of a member of the Russian royal family, however, in doing so he also betrays his best friend. His reward for his heroic act is to join the royal household, as bodyguard and companion to eleven year old Alexei, the Tsar’s son; this means leaving his family and going to live in the Winter Palace in St. Petersburg. Despite hostility from some of the other guards, Georgy starts to settle into his new life but gradually he becomes aware of the rumblings of discontent in some parts of society; the Tsar is forced to take action and orders Georgy to accompany him on a doomed train ride. Georgy knows that all is not well but couldn’t for a moment imagine what will happen next. Boyne is a first rate story teller. For all the irritations of improbable dialogue (would a two year old really ask “Father, whose present is the best, mine or mother’s?”) and historical inaccuracy, this is an immensely readable book that kept me gripped from start to finish; admittedly, I did persevere partly because I couldn’t quite believe that the author was trying to get away with such a ridiculous premise. More interesting to me than the events of the Russian revolution was the portrait of a marriage repeatedly put under renewed strain. As Georgy starts his story he explains that Zoya, his wife, is in hospital enduring the final stages of cancer; we learn that when she was diagnosed, Zoya chose not to undergo some of the more invasive treatments but bore her illness almost like suffering a justified punishment. As the story progresses we learn of the death in a road accident of their only daughter; of an affair Zoya had with a colleague; of a life seemingly lived without pleasure. Throughout all this Georgy has remained doggedly loyal to this strange woman. At 496 pages it’s a long book but Boyne is not verbose; on the contrary he can depict memorable scenes with enviable economy but there are simply too many that are not essential to the story. The scene where Georgy, newly arrived at the Winter Palace, sits alone in a dark corridor as instructed, unsure exactly what awaits him, is eerie and full of foreboding. A chapter which recounts the couple’s arrival in Paris is superbly evocative, conjuring up exciting images of a city recovering from war, a city filled with people from all over Europe, many looking to start new lives. A short subplot involving a young married couple that Zoya and Georgy become close friends with is a dramatic and page turning aside but could easily have been omitted as a minor concession to brevity. This is just one example of Boyne’s tendency to over-egg his pudding, using several examples when one or two would suffice. “The House of Special Purpose” (the title’s gloomy significance is revealed towards the end of the book) is not a bad book but I found it personally unsatisfying. If you don’t care too much for historical accuracy, you might be able to overlook those particular short-comings but some serious issues with clumsy story telling cast a shadow even more gloomy than the fate of the Romanovs. 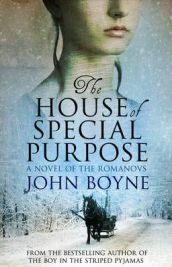 One Comment on "The House of Special Purpose"
The story of the Romanovs is one I know well, and have read widely on the subject. The idea of a novel of this tragic story is a strange notion, and I can’t decide whether to give it a go or not – I might be driven mad by historical inaccuracies!